Chores can be a major source of contention in many families—especially when teenagers are involved. Whether your teenager always promises, "I'll do it later," or she flat out says, "I'm not doing that," getting young people motivated to get to work can be a challenge. And it can be tempting to nag your teen to get up and get moving when she's not making the effort. But, nagging isn't a good idea. Constant reminders are likely to make your teen less motivated and less responsible. Your teen isn't likely to remember to take the trash on Tuesdays if he knows you'll remind him a dozen times. And he isn't likely to leap into action the fifth time you've told him to do something if the first four times weren't effective. It's important for kids to have chores. And chores are a great way to teach teens to be more responsible. Here's how you can get your teen to do chores without nagging. Asking your teen to do a spontaneous chore can lead to an argument. If you see your teen watching TV on Saturday morning and you suddenly ask, "Can you please clean the garage now?" you're likely to be met with resistance. When possible, make your expectation clear ahead of time. Assign regular chores that you expect to be completed routinely such as emptying the dishwasher and cleaning the bathroom. Make spontaneous requests to complete extra chores as infrequent as possible. The teenage years are the perfect time to learn valuable life skills, such as self-discipline. Offering a little flexibility and freedom around chores gives your teen an opportunity to practice these skills. Tell your teen he can use his electronics or enjoy his other privileges once his chores are done. Then, leave it up to him to decide when to get to work. He'll learn to manage his time better when he's able to make small choices on his own. While some parents want to pay an allowance for all chores, others think kids need to chip in and help out without the expectation of being paid. Sometimes, a middle of the road approach is a good way to instill valuable life lessons while still teaching responsibility. 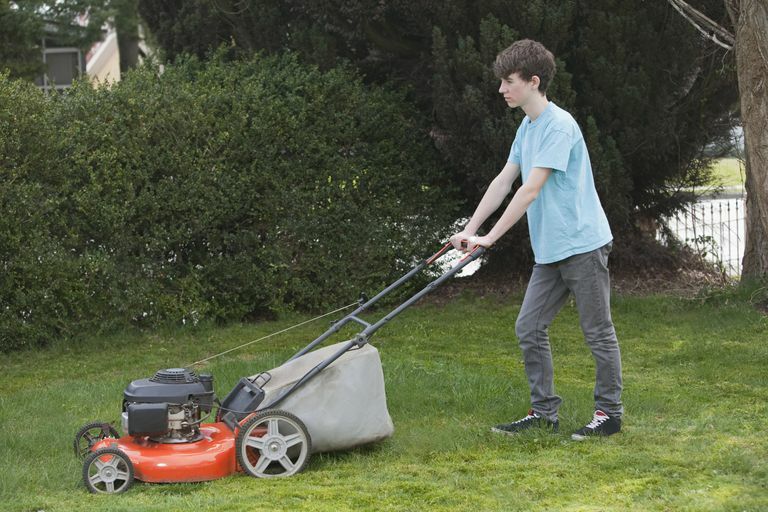 Consider paying your teen for extra chores that you might hire someone to do. Babysitting younger siblings, mowing the grass, or raking the lawn might be paid a commission. Cleaning his room, doing the dishes, and helping with meals are just part of being a good citizen. Make it known what will happen if your teenager doesn’t do his chores. Whether you simply don’t allow him to earn any money or you take away his privileges, make sure your teen knows it's up to him to decide his fate. If he chooses not to do his chores, follow through with the consequences without giving him reminders. If you purchase everything your teen wants, or you give him unlimited privileges regardless of how much work he puts in, he won't be motivated to do his chores. Cover the basic necessities, but don’t hand over spending money or extra privileges just because your teen asks. The goal is for your teen to eventually be able to complete all of his chores without requiring any reminders. After all, you won't be there to nag him to clean his room when he's 30 (hopefully not anyway). But, if your teen needs one reminder in the beginning, go ahead and give it to him—but stop at just one reminder. You can offer an “If…then” statement to remind him of the consequences. Try saying, “If you don’t get the bathroom cleaned before bedtime, then you won't be allowed to use your electronics tomorrow.” Then, leave it up to him if he is going to do it. If he chooses not to do his chores, follow through with that consequence. Avoid lecturing or shaming him, but instead, make it clear he can choose to do his chores in the future if he wants to retain his privileges.